Did you qualified for the FIFA 17 Weekend League and want to known what will happen next? You are in the right place. 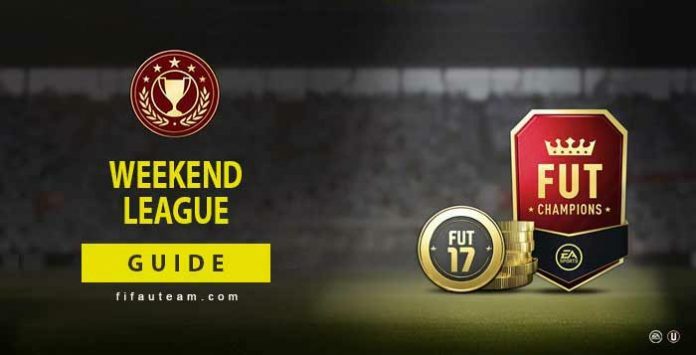 In this guide you can find the FIFA 17 weekend league calendar / schedule, requirements and rewards. FUT Champions is a game mode within FIFA Ultimate Team that rewards the best players with amazing prizes. Players are able to compete in daily cups with the goal of reaching the weekly cups and monthly finals. They need to play consistently well and climb the monthly leaderboards to earn in-game rewards and have the opportunity to take their game to the world stage, including the Ultimate Team Championship and the FIFA Interactive World Cup (FIWC). Online FUT Tournaments were replaced by daily knockout tournaments, as part of FUT Champions. You only need to win one of the daily tournaments across the week, stay in division 1 or classify on at least gold tier of previous week to earn an entry at the FIFA 17 Weekend League. This page is your only stop for Weekend League rewards, entry requirements and calendar. Player Quality: Min. silver in your subs. Available here alongside with the monthly rewards. Born in the late 70s, Rodrigo Lopes is a video game enthusiast. He started on the old ZX Spectrum 48k and has played every FIFA game to present day. He is an engineer, that also writes about FIFA games on another popular website. Rodrigo is an Ultimate Team expert, he loves football and is a huge Benfica fan. He has influenced thousands of FIFA gaming fans with his cutting edge insights and scientific level approach to writing about FIFA gaming modes. Join him on Google Plus. Hi There. I finished Gold 3 last weekend but haven’t been granted qualification to this weekends league. I have received my rewards, just the entry?! Can you help? EA had a few problems delivering the rewards. If you still don’t have your qualification, please contact the EA Support. Does a team of the week player count as gold? It depends. A TOTW card can be gold, silver or bronze just like a regular card. If you have a god TOTW card, then it counts as god. How many weekend leagues can we play for monthly rewards ranking? 4 or 5? It depends on the month. Some months have 4 rounds, others 5 and there are also cases of months with only 3 rounds. On the top of this page you can see how many rounds each month has. Is the last month for weekend league end of June? Is there a break over the summer? No, it isn’t. Weekend League is still live on July (not confirmed for August). it means the all have to be gold? And if so, Common+Rare: Min 15 what does it means? Yes, they all have to be gold. Not even one of your 18 players can be silver or bronze. About the other requirement, it means that only 3 of your 18 players (or less than 3) can be TOTW or special (legends, OTW, SBC, TOTGS, Movember, scream, etc). Anyone can register for this? It’s probably a bug. Try to logout and login again and also check that none of your subs has a training card applied to him. what do they mean with max 3training items ?? It means that only 3 players can have a training card applied to them. What do I do about the latency problem I’m expering in FUT Champs where I only get one bar and cannot participate in it. I live in Asia, Malaysia to be precise and my internet connection is really good. Please help me out, God bless. Hi. Sorry to hear about that. Maybe you should try to follow this guide. A good connection is useless if it is not with the right configuration. Can I use a full Bundesliga team for the next Weekend League? Hi , the weekend league is canceled but the prize we will get the prize?? The weekly rewards of the previous WL were delivered 30 minutes ago. is it true that you cannot have more than 5 players on a team with the last weekend of january is the 5 players from one league maximum starting 11 and subs? Hi it says that the next weekend league will be in 7 days and this daily tourney that should end by 7am Uk says it still has 1d and 13 hours left. is this glitched? only happened an hour ago cause earlier today there was nothing wrong with it. The weekend league of this week was cancelled. Hi. it’s Thursday and I think I should’ve gotten my rewards by now, I’m playing on PC and I got gold 2, which is pretty average. Do you think I’ll even get them? FUT Champions Weekend League rewards and automatic qualification will both go out before the start of the following Weekend League. Rodrigo, é normal ser quarta feira à noite e os prémios do FUT champions ainda não terem caído na minha conta? Obrigado! É anormal. Mas receberá antes da próxima weekend league. Hello, From 16th January to 26th of January there are no daily knockouts wth no entry requirements?